The Kuhn GMD Select Series is an all-new evolution of existing Kuhn mowers for small and mid-sized farms. These simple, durable mowers with working widths of 5’3" to 9’2" offer fast, clean mowing of heavy grasses and delicate forage crops. 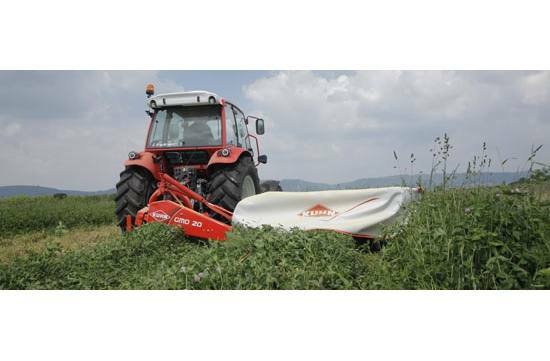 The Kuhn GMD Select mowers provide exceptional cutting and outstanding reliability. Backed by decades of ultra-reliable service, the 100 Series cutterbar features Protectadrive® safety to help protect the cutterbar against damage if an obstacle is encountered. All adjustments are simple and easy to perform with minimal greasing points and limited overall maintenance. The redesigned headstock keeps the mower close to the tractor, reducing overhang and increasing safety when mowing in rough fields. An outer swath wheel provides clear separation of cut and uncut crop.